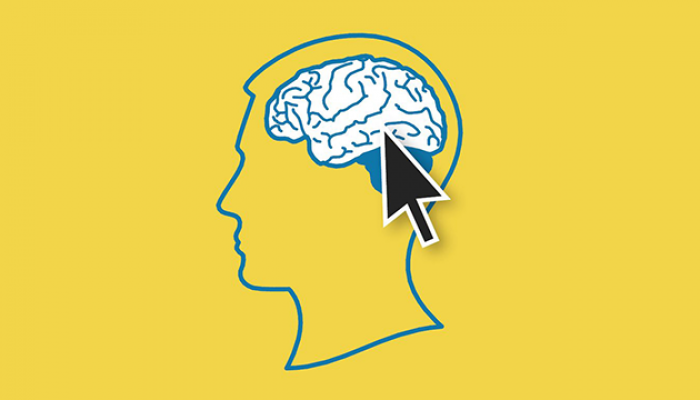 The conversion rate that you use today might be up to 85 % wrong compared to what you actually want to look at (more examples will follow below). Therefore, it is important to know WHAT you want to look at and WHY. 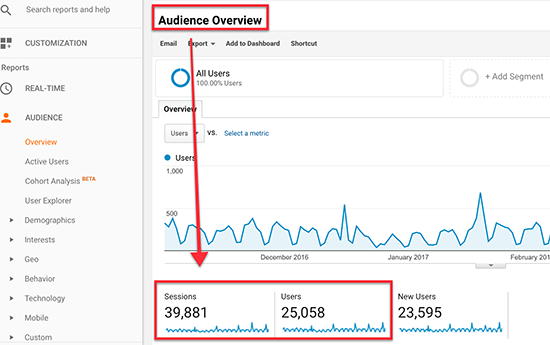 Google Analytics displays several numbers that can look drastically different from what you’re trying to improve CRO wise. In this post, we want to clarify the differences between the Sessions and User levels. 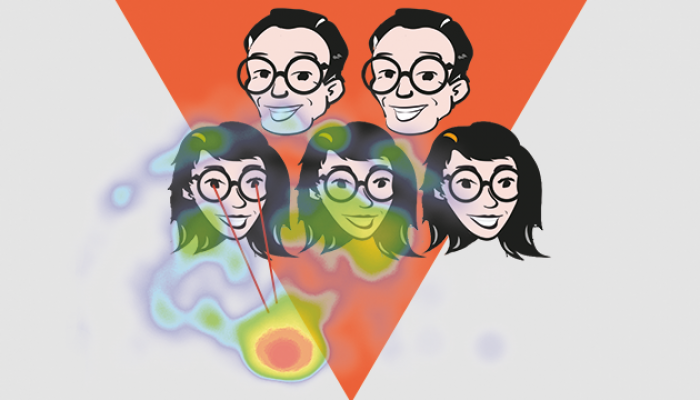 You’ll get a sneak peek of what goes on underneath the GA hood, WHAT you can base your conversion rate on and HOW to get the right numbers if you don’t have them already. The difference between the Sessions and User level is also relevant for other analysis tools, such as Adobe Analytics. 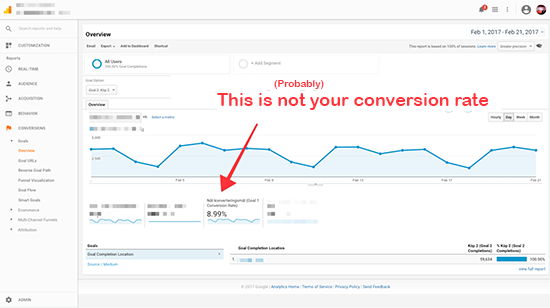 Do you look at your conversion rate as it is displayed by default in Google Analytics? Okay, but what about Ecommerce tracking? For several types of conversion goals, these can be ok or even the best conversion rates to look at. 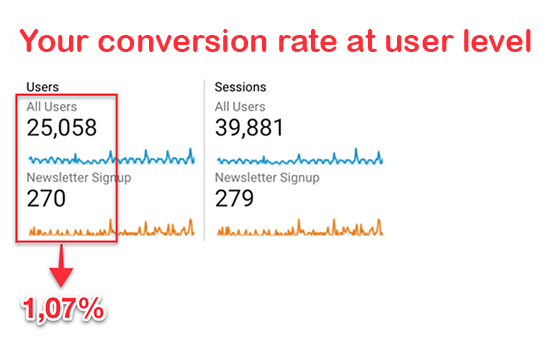 The two metrics that are displayed in the conversion rate reports above, “Goal Conversion Rate” and “Ecommerce Conversion Rate”, show how many % of visits (Sessions) that included some form of conversion. But in most cases, you’re more interested in the % of unique visitors (Users) who performed a certain action. That is, not the conversion rates displayed in the conversion rate reports above. Discussion time! Please leave a comment regarding your view on conversion rate and your site’s different goals. For example regarding an A/B test, a campaign, site changes etc. Another example: to make more visitors go through a funnel, it’s often more interesting to look at the % of Users who reach a certain stage. 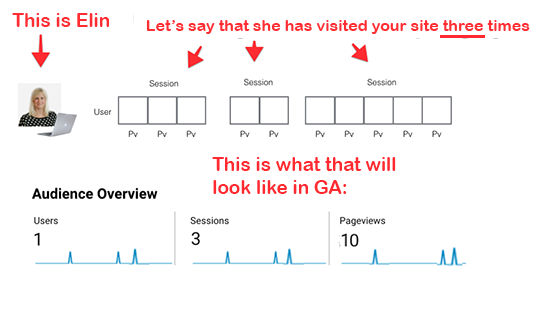 If you instead look at the % of Sessions, visitors that visited your site several times before converting will count multiple times, the first visits as drop offs and the last visits as conversions. Cross device: If a visitor came in to your site through multiple devices that were not connected, through for example UserID, s/he counts as several visitors. 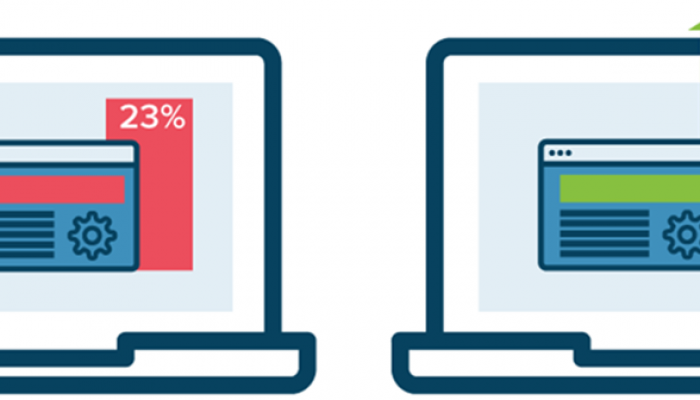 The cross device behaviour can affect conversion rate at Sessions and User levels in several different ways. 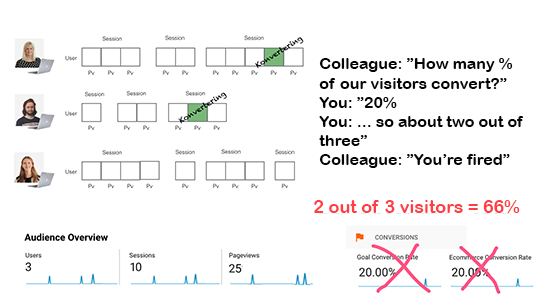 A converting visitor with 2 mobile visits, 2 desktop visits will at the User level be counted as 1 out of 2 = 50% and at the Sessions level as 1 out of 4 = 25%. Start with what you know about your cross device behaviour, visitors who complete purchases etc at your site and choose what you think best mirrors what you want to optimize. None of the ways available are perfect. It’s mostly about making sure that the cross device function works correctly so that you can avoid having a high percentage of visits that can’t be connected to a User ID. A/B testing tools such as Optimizely and VWO are usually based on User level. Therefore, it might be a good idea to check the GA User level data if you send data to GA from Optimizely. Of course, you can also look at Sessions level data if you think that it’s more relevant. If you run an Ecommerce site, your main focus should be to look at Revenue per User (Revenue/Unique visitor) since it includes all changes regarding your conversion rate, average order value and transactions per user. a 9 – 85% error margin, is that the kind of precision that you feel comfortable with when evaluating your (tough) CRO work? This is one of the few reports in which you can see both the number of Users and Sessions. 2. Create a segment for visits that contained a conversion which matches the goals you want to look at. Pro tip: You can see how goals are configured and create a segment with the same configuration in Admin > View. 3. Apply your own segment together with the built in segment “All Users” and calculate! 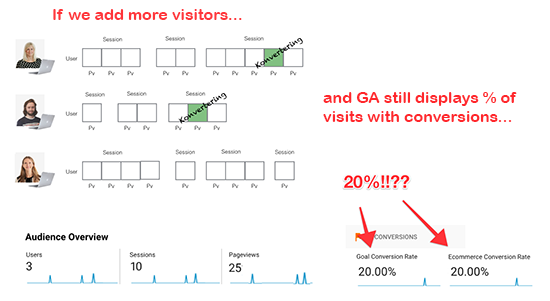 Today, the conversion rate reports in GA use the Sessions level. The next time you set up an A/B test, a dashboard or a goal for re-design, think about which level you want to look at (Session or User). Discussion/Questions: How do you calculate conversion rate at your company?